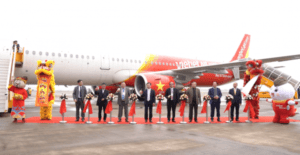 Vietjet officially welcomed its first flight connecting Ho Chi Minh City and Van Don in Quang Ninh province last week. Vietjet is the second airline to fly to the recently opened Van Don International Airport after Vietnam Airlines introduced service from Ho Chi Minh City earlier this month. Vietjet’s latest route connects the largest city of Vietnam with sprawling Halong City where most visitors stay when visiting the UNESCO World Heritage Halong bay famed for its 1,600 limestone outcrops and island. Halong Bay is one-hour bus transfer from the airport. The bay is the country’s top sightseeing destinations and home to a fleet of junks and cruise boats that offer island-hopping trips on the bay. The Ho Chi Minh City – Van Don flight will operate on Monday, Wednesday, Friday, and Sunday with a flight time of around two hours and 15 minutes each way. The flight will depart from Ho Chi Minh City at 0700 and arrives in Van Don at 0915. The return flight takes off at 0950 and lands in Ho Chi Minh City at 1205. As usual, the airline is offering discounted fares only available from 1300 to 1500 (Singapore time) on the airline’s website.